The Valley’s rising population in the 1930s and 40s increased the demand for water. That demand was also evident in Ventura and in 1944, an act of the legislature formed the Ventura County Flood Control District. They employed Donald R. Warren as consulting engineer to evaluate the local water situation and he recommended a $3 million bond issue to construct a dam in the Matilija Canyon and another on Coyote Creek. [Construction began in June, 1946.] 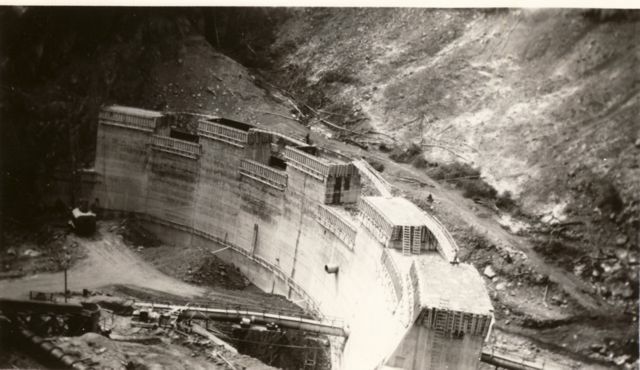 The Matilija Dam project met with major problems. Unexpected delays, rising costs and heavy criticism plagued the job. Clay began oozing from under the dam foundation in Matilija Canyon, and the carpenters walked out. The dam was eventually deemed unsafe and a lawsuit against the engineering firm ensued. This proved to be a very costly decision. 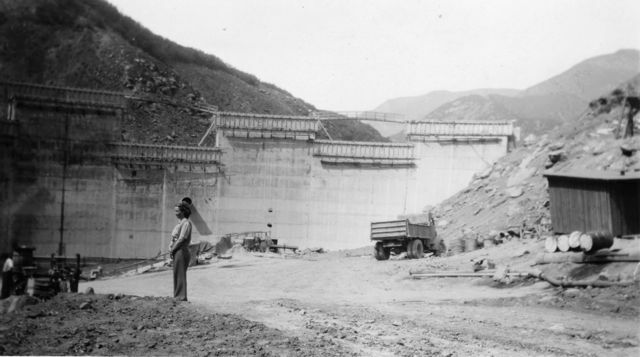 Finally, despite all of these adversities, the site was judged safe and the workers completed the Matilija Dam in June, 1948. But the beautiful new dam stood embarrassingly empty for three years, as a severe drought was in progress. There wasn’t enough rain during that time to make more than a mud hole of the huge reservoir and that is what water customers were getting–mud. Finally, during the winter of 1951, a storm produced enough rain to fill the reservoir to capacity and the first spill occurred the following January . Conduit pipe carried water to the spreading grounds near the mouth of Senior Canyon at a rate of 1,350 gallons per minute. This water percolated into the ground and helped replenish the wells below. 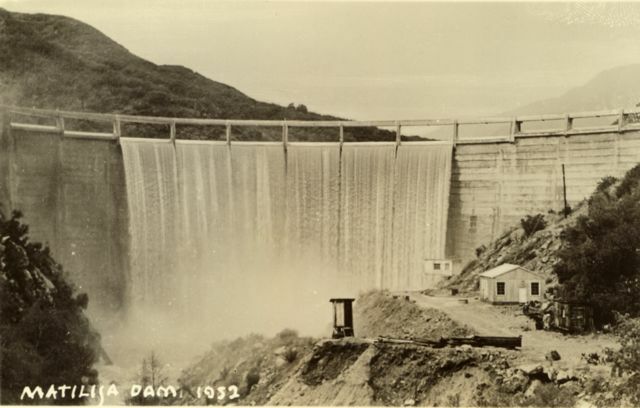 By March, 1952, 44,960 acre-feet of water had been lost over the Matilija dam spillway to the ocean. It was evident that a larger facility was necessary, especially when considering the long-range water picture. In the meantime, geologists tested a dam site at Coyote Creek. A possible fault caused the project to be canceled, but after further investigation, this decision was reversed. Consultants for the flood control district recommended a 90,000 acre-foot reservoir on Coyote Creek to stop the Matilija overflow, and the project was approved. The Federal Bureau of Reclamation completed Casitas Dam in 1959. …Casitas Municipal Water District presently operates Matilija Dam, which is owned by the Ventura County Flood Control District. No water is served to customers from this source. Lake Matilija is used primarily to store water during flood periods for later transfer to Lake Casitas. The above is excerpted from Patty Fry’s bookÂ The Ojai Valley: An Illustrated History. The book was updated in 2017 by Elise DePuydt and Craig Walker. It is available in the museum’s store and through Amazon.com. I remember when I was around 5yrs old taking a row boat with my father (H.C. Mashburn) born and raised in Ojai himself. Anyway we were out with our dog and he jumped in the water which was not okay with the ranger up there so he told my father to get than darn dog out of the water. My father in his lay back way said if you think you can get him out go ahead and try. The ranger went after the dog and he would just swim away from him … that kept him busy for awhile. As a teen we used to jump off the top of the dam. If I recall I think we got in a little trouble for that. Fun times though. That same ranger that Mitch Mashburn mentions may have been the one who objected to my small sailboat that I launched several times at Matilija. There were several rowboats at Matilija, but….a sailboat?…just seemed too much for the ranger. Mine was licensed and my arguements prevailed. What finally drove me from the lake were the gusts of wind that seemed to whip down the valleys of the surrounding hills. They made easy sailing virtually impossible. My experiences were in the early 1960’s. Getting into and out of the recreation area of the lake was itself an experience as the road was very narrow and nothing more than a cut along the mountain side. I recall it as not more than a single lane in and out. On August 26th 1974, I began my career as a Park Ranger with the Ventura County Parks Department. I was assigned to Matilja Lake Park and, as a stipulation of employment, required to reside in the County-owned residence in Campground No. 2. 37+ years later, I’m still with the department, but my title has changed to Park Services Ranger II. I believe that John Steen (deceased) was the last Park Ranger to work/reside at the park when Matilija Lake was still open for public use. If I recall correctly, the plug was pulled on the lake in 1965 when the dam was determined not to be in the condition it should be in order to hold back so much water. The lake was closed to public use then and has never been reopened. After Steen retired, Ed Brown became the next Park Ranger to work/reside at the park. When Brown left the Parks Department, I was hired. I was only 23 years old and, to this day, the youngest fulltime Park Ranger ever hired by the department. It was a dream come true for me. I was born in 1951. This was the first year that the lake filled to capacity. I remember many fine outings to the lake with my parents for fishing and camping trips. When I was a teenager, several of my buddies and I would ride our small motorcycles to the park for camping trips. We’d fish for rainbow trout in Matilija Creek because the Department of Fish & Game was still planting fish at the time. Park Ranger Steen would come by and visit with us. I worked for four summer seasons for the Parks Department while I was attending high school and college. I worked three summer seasons at Soule Park Golf Course in Ojai before the department leased the course to a private concern. I worked one summer at Steckel Park in Santa Paula. I guess I must have been a pretty good worker because, a few years later, the department hired me to run Matilija Lake Park. I emensely enjoyed working at Matilija Lake Park, but have always wished that I had been able to work there while the lake was open to the public. One of my main duties was to keep trespassers away from the lake by making periodic patrols of the area. Often times, I had to open a locked gate, then drive down the single lane, dirt road to the dam. The dam had it’s cat-walk removed and had been notched at the top to lower it’s holding capacity of water. On February 10, 1978 at 12:10 am, the raging Matilija Creek ate through an earthen dike about 1/2-mile upstream from the park. The raging torrent surrounded the Park Ranger residence. I barely got out with my first wife, two dogs and three cats. We spent the night at a neighbor’s (retired Park Ranger John Steen’s home that was upcanyon). When I returned to the park at daybreak, the house had been undermined. It was almost gone. Campground No. 2 was obliterated. About half of Campround No. 1 (now, the “Matilija Environmental Science Area”) was left. The department closed the park and terminated the lease with the Ventura County Flood Control District. I could go on and on, but I’ve rambled too much already. Thank you for taking the time to read all of this diatribe. Matilija Hot Springs resort and swimming pool used to be owned by the Ventura County Parks Department a number of years ago. The department sold the piece of property to a private concern. The new owner has never opened the hot springs and swimming pool to the public. The resort/swimming pool is downstream from the Matilija Lake dam. A mile or so, before Matilija Canyon Road on Highway 33, is a road that goes to the resort/swimming pool and the dam. This would be a left turn, if driving northbound on Highway 33 (AKA: Maricopa Higway) I’m uncertain as to the name of the road. There’s a wooden sign with routered lettering at the entrance to Matilija Hot Springs that will give you some history of the area. The dam is closed to public entry. There are natural hot springs on private property along Matilija Canyon Road. To my knowledge there aren’t any hot springs in the canyon that are open to public use. Many, many years ago, the United States Forest Service map had a single hot springs on it that was next to Matilija Canyon Road. This created problems because this spring was on private property. I’ve heard that Hanging Rock was demolished in order to construct the dam for Matilija Lake, but others believe it was not demolished and is under Matilija Lake. I recommend that you go to “Hanging Rock — A Trysting Place.” on this web site for more information. Drew we love your rambling on and on. I just want to add that Jack Dempsey the boxer trained at the Matilija Hot Springs. Correct me if I’m wrong. I did also jump from the Dam into the Water, and it was a long way down! Jack Dempsey trained at Pop Soper’s resort that used to be just down Highway 33 from the Matilija Hot Springs a mile or so. I’m not 100% positive, but I believe that some of Soper’s place wound up turning into the Ojala Resort. Doesn’t surprise me that you and your brother (Mitch) jumped off Matilija Lake Dam. You Mashburn boys have always been a little nuts! Ten years ago, when I was still living in Ojai, i visited some friends who lived in the cottages at Jack Dempsey’s old training camp. They have been turned into rentals. There was a small natural water swimming pool, but it was empty. It was a lovely place to live, but when it rained too hard, the river you needed to cross on one side would become very dangerous, as the suspension bridge was droopy. A neat piece of history, but I hope that they finally tore down the Matilija Dam . The damage it has done to the Ventura River is frightening. In the early 70s I used to swim in the lake behind the dam. deep, cool and utterly refreshing when the temp was hovering around 100. yes, it was illegal. no, we didn’t care. I used to go fishing and swimming in lake Matilija with my younger brother and my cousins when we were kids. Great trout fishing there. I remember one time the 4 of us found a wooden raft and we used branches to paddle the thing out on the lake over by the dam. The local law showed up and we all walked up to meet him. When he found out we were local he just told us we could swim but not to fish so that’s what we did. I also worked across from Matilija for the lady that owned Tara the roller skating elephant. I, my brother and my best friend built the fence around her place and installed the drywall in the barn where her elephant stayed. Ms. Buckley was a very nice person and it was hard work for a bunch of teenagers. In the mid 60’s, my friends and I would ride our bikes up 33 from Ventura, past the dam and lake, and up the road with all the little cabins on it, past the sulpher spring, and go “off road” back in there somewhere. We’d park our bikes and hike up the creek, make a camp, and enjoy some pretty good trout fishing. Fond memories of what now seems like an old-fashioned childhood. I always wanted to go out in a boat onto the lake…never did though. I also spent a lot of time at the Ojala Resort…mostly in the pool and the store. We used to have a trailer at the Ojala Resort in the 70’s.. (Never knew it was “resort”) some of the best memories of my childhood are from there…i learned to swim in that pool in fact…and can remember catching lizards and frogs every weekend, always bringing them home home to our house in oxnard, our yard sounded like Matilija Creek for years from all the frogs! Anyway, I never knew the real history behind Ojala, can anyone shed some details, my folks have both passed away and this has always been something I’ve wondered about as I never knew how we came to have a trailer there. I still smile every time I drive past that old swinging bridge on my way to the backcountry! Thanks in advance to anyone with some history on Ojala. Search “Wheelers”. This should yield “Wheeler Hot Springs: New Owners Confront Old Issues”. This story will show you a photo with ” Soper’s Ranch at Ojala”. I rented an old cabin for several months at Ojala with a buddy (Mike Ernest) in about 1970. I believe a lady named Bernie McMillan owned Ojala at the time. Ojala had been severly damaged by the major flooding in 1969. It closed as a resort, but McMillan rented out the cabins to long-term tenants. The cabin I rented was near the “old swinging” footbridge you mentioned. The cabin I rented was demolished years ago. Thanks for the info Drew, interesting article. Thank you. Enjoyed reading the info-history about Wheeler Hot Springs, Matilija dam, lake and resort and Ojala. All three places were fun places of my childhood (1950 to 1969) and I have many good memories of the area and the Maricopa Highway. The swimming pools at Matilija and Ojala were summer days of fun for my girlfriends and I. Our parents would drop us off and we would spend hours swimming and flirting with the boys. My parents, family and friends spent many summer weekends at Wheeler and Matilija, swimming in the pools and having Bar-B-Q’s. I remember the high dive platform at Matilija pool. The Matilija pool was actually two pools side by side. One large deep pool and one shallow fool for little kids. During the summer of 1980 I made a trip to the Ojai Valley to see family and friends and I took my two sons to Matilija and the swimming pool was still open and in use. But it’s glory days were gone. Our Senior Girl Scout Mariners group, the M.S. S. Drake from the Burbank Girl Scout Council, camped at Lake Matilija during the early 1960’s. I have an old sweatshirt with Matilija patches from 1960 and 1962. Lots of fun! Just wanted to thank everyone for posting comments! I could read these stories for hours! I know my older brother Drew use to live at Ojala. He rented the cabin that hangs over the river and is on stilts. If I remember correctly he had a motorcycle (441 Victor, BSA) anyway some how he got the gates open on both ends of the suspended bridge and he rode that thing across it. He calls me nuts for jumping off the dam. Well hey there Mitch, Drew and Neal. Well hey there Mitch, Drew and Neal. I so enjoyed all your comments. Johnny Steen was the last Ranger there in Matilija and he was such a good friend of mine. We met when I worked for Bud Rowe at Casitas Boat Rentals in the late 70’s. Johnny and I did a lot of trout fishing and laughing. What a unique person he was. And sooooo many stories. His cabin washed into the Creek during that horrible storm. He made it out only minutes before it fell into the raging water. 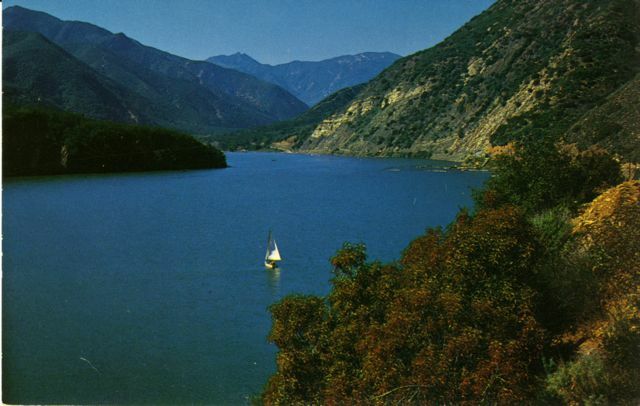 Bud Rowe and his dad were the original Boat Rentals owners at Matilija Lake (before the concept of Lake Casitas). Bud and his dad started the Boat rental operation at Matilija with a couple of skiffs and a handful of 3hp motors in the back of a pick-um-up truck. Matilija Lake was quite a bit larger then as you can tell by the notching at the dam. And Johnny Steen was always larger than life. Johnny Steen was the last Park Ranger stationed at Matilija Lake Park when the lake was still open for public use. Two more Park Rangers followed him. The first was Ed Brown, then myself. A big part of Brown’s and my jobs was to keep trespassers out of the closed lake area. On Feb. 10, 1978, Matilija Creek was a raging torrent. It demolished the park which the County never reopened. I was moved to another park. Yes, Steen was quite a character! After he retired, he decided to live in Matilija Canyon. Therefore, he’d drop by the park almost daily and we’d chat. He always had a “joke of the day”. My father (Harold C. Mashburn) built a small rowboat. He wound up selling it to the Rowes and it became one of their rental boats. I remember going out fishing with my Dad in rowboat on Matilija Lake when I was a small boy. I can barely remember the launch ramp and boat docks which were located at the mouth of Rattlesnake Canyon. When we camped in the campgrounds, I remember Park Ranger Steen dropping by to check on us. Amazing that years later, I wound up being the Park Ranger there. It was a dream come true! Oh what memories. We used to going camping at Matilija in the 60’s & 70’s when I was small. Dad would get us up early to go catch fish for breakfast. Thinking it was campgound 2 as I am remembering a earth dam. I do remember we were on the other side and there was a man made swimming pond near the restroom facilities (I think). I remember one time my aunt put rocks in the fire pit one time I think to hold the grate and the rocks exploded due to the moisture in them (The great rock exploding trip). He also told me of time when I was a baby and a group of bikers showed up and were being loud and obnoxious. He went and found the Ranger and they went and confronted the bikers. He found out later that one of the riders and passenger were killed in the canyon when they drove off the road. To bad about the place now. Sure had a lot of fun as a kid. Is it open to the public now? As I stated in my comment above, the two campgrounds in Matilija Lake Park were demolished by the major 1978 floods. Campground No. 1 was located on the opposite side of the river from Matilija Canyon Road. About half of that campground was eroded away by the flooding. Over the years, almost all of it has eroded and what’s left has been overgrown with vegetation. Campground No. 2 was completely washed away by the 1978 flooding. The lake has been closed to the public since about 1965. So, to directly answer your question…………..No, Matilija Lake Park is non-existant and, therefore, closed to the public. If you’ve never done so, you should drive to the very end of Matilija Canyon Road. You will find the trail head to several United States Forest Service trails at the end of the road. The trails are fantastic to hike! Thanks for that tip about the trails. This August I am visiting Oakview and Ventura (where I grew up) for the first time in about 30 years, and I will plan on driving in to the trailhead and doing some hiking. I’m positive that you will find the trails in Matilija Canyon a delight! I recommend that you first make a stop at the United States Forest Service office on Ojai Avenue in Ojai before hiking the trails. You may want to purchase a Los Padres National Forest map. Plus, the USFS office sells hiking guide books that contain pertinent information about the trails. Of course, the USFS office personnel will be able to answer any questions you might have too. Happy Trails! Is it illegal to fish the lake? Yes, it is illegal to fish the lake. The lake is closed to the public and has been so since, at least, 1965. To my knowledge, the Ventura County Sheriff’s Department is the main law enforcement agency that enforces the closure. There aren’t any agencies stocking the lake with any species of fish and has not been in years and years. Nor are there any agencies stocking Matilija Creek with any species of fish that might find their way into the lake. Give Lake Casitas a try. Tight lines! I remember swimming in the pool at Ojala in the mid 60’s. It was a wonderful way to spend a hot summer day. In the 70’s and 80’s we often started or ended many a backpacking adventure near Matilija Lake at the trailhead parking lot. The 70’s still meant pretty good fishing along the upper North Fork. A beautiful hike is from Cherry Creek above, down into the North Fork canyon to cars waiting at the trailhead. I don’t think very many people benefited from the lake itself, having been wrought with problems and mostly a mystery to kids my age. I have to say after knowing what dams can do to an ecosystem I really wish they’d remove that dam and let the canyon recover. It could give locals and government officials a real sense of pride if they could accomplish it. Finally! A little information about Ojala Resort! I remember going there as a kid in the late 60’s and/or early 70’s. Over the years I have mentioned this to others who did not remember any such place. Glad to know I was not imagining this. Thanks for a little history. Would love to read more. What fun to read history of Matilija. I was born at home on Rice Road, Mira Monte area) in 1941. Until my family “blew up” in mid-50s, the entire Valley was my playground. We swam in the Ventura River, Matilija Creek and creeks & irrigation ponds on what was called Matilija Ranch. The pool at Matilija Hot Springs was open to the public…except when it and other public pools were closed because of Polio outbreak. We fished anywhere we thought fish would hangout, including the large pool at the bottom of Matilija Dam. As children are apt to do, I had an imagined troop of monkies that picked apples at Rancho Arnaz. Mirrow Pond was good for rafting, catching frogs, and running away from whoever owned the property. It was a Huck Finn childhood. Reading these stories has been a privilege, ladies and gentlemen! I am an undergrad student at Cal State Channel Islands in the Environmental Science program. One of my projects is on the Matilija Dam. It is a story map, check it out here: https://arcg.is/1uLGzO. Anyway I really appreciate all of these stories. I’m hoping I can integrate them somehow into my story!